Default window type for explorer to open in : . This option allows you to select a default window type that explorer will open in. 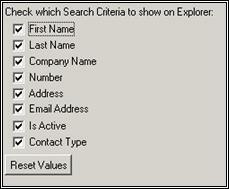  Auto-search in explorer enabled at startup - When this option is selected, the explorer will auto-search for information. If this option is not selected, the explorer will not auto-search for information. Default number of records pulled in Single Mode: . This option allows you to choose the number of records that will appear in an explorer by default. Out 30 days or less: . Orders that still have a balance but are less than 30 days old will appear in the color chosen here in explorers. Out 31 to 60 days: . Orders that still have a balance and are between 31 to 60 days old will appear in the color chosen here in explorers. Out 60 to 90 days: . Orders that still have a balance and are between 60 to 90 days old will appear in the color chosen here in explorers. Out over 90 days: . Orders that still have a balance and are older than 90 days will appear in the color chosen here in explorers. Due Date Today or in Future: . 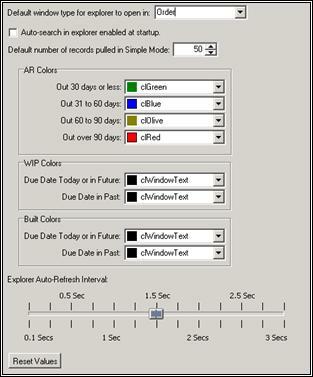 Orders with a status of WIP with a due date of today or in the future will appear in the color chosen here in explorers. Due Date in Past: . Orders with a status of WIP with a due date in the past will appear in the color chosen here in explorers. Due Date Today or in Future: . Orders with a status of Built with a due date of today or in the future will appear in the color chosen here in explorers. Due Date in Past: . Orders with a status of Built with a due date in the past will appear in the color chosen here in explorers. This option allows you to choose the auto refresh interval for explorer.  Order Number. If this option is selected, this filter will appear on the order and order history explorer. If this option is not selected, the order number filter will not appear on the explorer.  Company Name. If this option is selected, this filter will appear on the order and order history explorer. If this option is not selected, the company name filter will not appear on the explorer.  Contact Last Name. If this option is selected, this filter will appear on the order and order history explorer. If this option is not selected, the contact last name filter will not appear on the explorer.  Description Text. If this option is selected, this filter will appear on the order and order history explorer. If this option is not selected, the description text filter will not appear on the explorer.  Salesperson. If this option is selected, this filter will appear on the order and order history explorer. If this option is not selected, the salesperson filter will not appear on the explorer.  Entered By. If this option is selected, this filter will appear on the order and order history explorer. If this option is not selected, the entered by filter will not appear on the explorer.  Station. If this option is selected, this filter will appear on the order and order history explorer. If this option is not selected, the station filter will not appear on the explorer.  PO Number. If this option is selected, this filter will appear on the order and order history explorer. If this option is not selected, the PO number filter will not appear on the explorer.  Number. If this option is selected, this filter will appear on the order and order history explorer. If this option is not selected, the number filter will not appear on the explorer.  Total Price. If this option is selected, this filter will appear on the order and order history explorer. If this option is not selected, the total price filter will not appear on the explorer.  Service Tickets. If this option is selected, this filter will appear on the order and order history explorer. If this option is not selected, the service tickets filter will not appear on the explorer.  Not Calculated. If this option is selected, this filter will appear on the order and order history explorer. If this option is not selected, the not calculated filter will not appear on the explorer.  Current Order Status (WIP, Built, Sale). If this option is selected, this filter will appear on the order and order history explorer. If this option is not selected, the current order status (WIP, built, sale) filter will not appear on the explorer.  Historical Order Status (Lost, Closed). If this option is selected, this filter will appear on the order and order history explorer. If this option is not selected, the historical order status (Lost, Closed) filter will not appear on the explorer.  Estimate Number. If this option is selected, this filter will appear on the estimate and estimate history explorer. If this option is not selected, the estimate number filter will not appear on the explorer.  Company Name. If this option is selected, this filter will appear on the estimate and estimate history explorer. If this option is not selected, the company name filter will not appear on the explorer.  Contact Last Name. If this option is selected, this filter will appear on the estimate and estimate history explorer. If this option is not selected, the contact last name filter will not appear on the explorer.  Description Text. If this option is selected, this filter will appear on the estimate and estimate history explorer. If this option is not selected, the description text filter will not appear on the explorer.  Salesperson. If this option is selected, this filter will appear on the estimate and estimate history explorer. 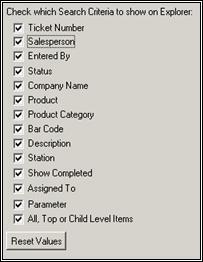 If this option is not selected, the salesperson filter will not appear on the explorer.  Entered By. If this option is selected, this filter will appear on the estimate and estimate history explorer. If this option is not selected, the entered by filter will not appear on the explorer.  Station. If this option is selected, this filter will appear on the estimate and estimate history explorer. If this option is not selected, the station filter will not appear on the explorer.  Number. If this option is selected, this filter will appear on the estimate and estimate history explorer. If this option is not selected, the number filter will not appear on the explorer.  Total Price. If this option is selected, this filter will appear on the estimate and estimate history explorer. If this option is not selected, the total price filter will not appear on the explorer.  Current Estimate Status (Pending). If this option is selected, this filter will appear on the estimate and estimate history explorer. If this option is not selected, the current estimate status (Pending) filter will not appear on the explorer.  Historical Estimate Statuses (Lost, Converted, Voided). If this option is selected, this filter will appear on the estimate and estimate history explorer. If this option is not selected, the historical estimate statuses (Lost, Converted, Voided) filter will not appear on the explorer.  Company Name. If this option is selected, this filter will appear on the company explorer. If this option is not selected, the company name filter will not appear on the explorer.  Contact Last Name. If this option is selected, this filter will appear on the company explorer. If this option is not selected, the contact last name filter will not appear on the explorer.  Email Address. If this option is selected, this filter will appear on the company explorer. If this option is not selected, the email address filter will not appear on the explorer.  Salesperson. If this option is selected, this filter will appear on the company explorer. If this option is not selected, the salesperson filter will not appear on the explorer.  Tax Class. If this option is selected, this filter will appear on the company explorer. If this option is not selected, the tax class filter will not appear on the explorer.  Number. If this option is selected, this filter will appear on the company explorer. If this option is not selected, the number filter will not appear on the explorer.  Address. If this option is selected, this filter will appear on the company explorer. If this option is not selected, the address filter will not appear on the explorer.  Is Active. If this option is selected, this filter will appear on the company explorer. If this option is not selected, the 'is active' filter will not appear on the explorer.  Client and Prospect. If this option is selected, this filter will appear on the company explorer. If this option is not selected, the client and prospect filter will not appear on the explorer.  Vendor. If this option is selected, this filter will appear on the company explorer. If this option is not selected, the vendor filter will not appear on the explorer.  Personal. If this option is selected, this filter will appear on the company explorer. If this option is not selected, the personal filter will not appear on the explorer.  Not Classified. If this option is selected, this filter will appear on the company explorer. If this option is not selected, the not classified filter will not appear on the explorer.  Has Open Estimates. If this option is selected, this filter will appear on the company explorer. 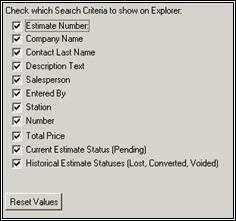 If this option is not selected, the has open estimates filter will not appear on the explorer.  Has Open Orders. If this option is selected, this filter will appear on the company explorer. If this option is not selected, the has open orders filter will not appear on the explorer.  Has Open Sales Tickets. If this option is selected, this filter will appear on the company explorer. 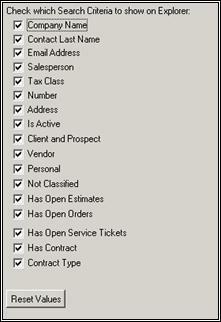 If this option is not selected, the has open sales tickets filter will not appear on the explorer.  Has Contract. If this option is selected, this filter will appear on the company explorer. If this option is not selected, the has contract filter will not appear on the explorer.  Contract Type. If this option is selected, this filter will appear on the company explorer. If this option is not selected, the contract type filter will not appear on the explorer.  First Name. If this option is selected, this filter will appear on the contact explorer. If this option is not selected, the first name filter will not appear on the explorer.  Last Name. If this option is selected, this filter will appear on the contact explorer. If this option is not selected, the last name filter will not appear on the explorer.  Company Name. If this option is selected, this filter will appear on the contact explorer. If this option is not selected, the company name filter will not appear on the explorer.  Number. If this option is selected, this filter will appear on the contact explorer. If this option is not selected, the number filter will not appear on the explorer.  Address. If this option is selected, this filter will appear on the contact explorer. If this option is not selected, the address filter will not appear on the explorer.  Email Address. If this option is selected, this filter will appear on the contact explorer. If this option is not selected, the email address filter will not appear on the explorer.  Is Active. If this option is selected, this filter will appear on the contact explorer. If this option is not selected, the is active filter will not appear on the explorer.  Contact Type. If this option is selected, this filter will appear on the contact explorer. If this option is not selected, the contact type filter will not appear on the explorer.  Recurring Order Number. If this option is selected, this filter will appear on the recurring order explorer. If this option is not selected, the recurring order number filter will not appear on the explorer.  Company Name. If this option is selected, this filter will appear on the recurring order explorer. If this option is not selected, the company name filter will not appear on the explorer.  Contact Last Name. If this option is selected, this filter will appear on the recurring order explorer. If this option is not selected, the contact last name filter will not appear on the explorer.  Description Text. If this option is selected, this filter will appear on the recurring order explorer. If this option is not selected, the description text filter will not appear on the explorer.  Salesperson. If this option is selected, this filter will appear on the recurring order explorer. If this option is not selected, the salesperson filter will not appear on the explorer.  Entered by. If this option is selected, this filter will appear on the recurring order explorer. If this option is not selected, the entered by filter will not appear on the explorer.  Total Price If this option is selected, this filter will appear on the recurring order explorer. If this option is not selected, the total price filter will not appear on the explorer.  Order, Estimate, or Recurring Order Number. If this option is selected, this filter will appear on the line item explorer. 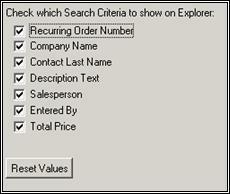 If this option is not selected, the order, estimate, or recurring order number filter will not appear on the explorer.  Salesperson. If this option is selected, this filter will appear on the line item explorer. If this option is not selected, the salesperson filter will not appear on the explorer.  Entered By. If this option is selected, this filter will appear on the line item explorer. If this option is not selected, the entered by filter will not appear on the explorer. 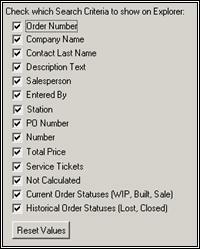  Order, Estimate, or Recurring Order Status. If this option is selected, this filter will appear on the line item explorer. 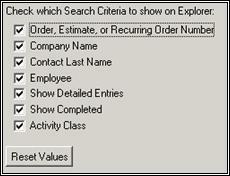 If this option is not selected, the order, estimate, or recurring order status filter will not appear on the explorer.  Company Name. If this option is selected, this filter will appear on the line item explorer. If this option is not selected, the company name filter will not appear on the explorer.  Product. If this option is selected, this filter will appear on the line item explorer. If this option is not selected, the product filter will not appear on the explorer.  Product Category. If this option is selected, this filter will appear on the line item explorer. If this option is not selected, the product category filter will not appear on the explorer.  Bar Code. If this option is selected, this filter will appear on the line item explorer. If this option is not selected, the bar code filter will not appear on the explorer.  Description. If this option is selected, this filter will appear on the line item explorer. If this option is not selected, the description filter will not appear on the explorer.  Station. If this option is selected, this filter will appear on the line item explorer. If this option is not selected, the station filter will not appear on the explorer.  Variable. If this option is selected, this filter will appear on the line item explorer. If this option is not selected, the variable filter will not appear on the explorer.  All, Top or Child Level Items. If this option is selected, this filter will appear on the line item explorer. If this option is not selected, the all, top or child level items filter will not appear on the explorer.  Show Completed. If this option is selected, this filter will appear on the line item explorer. If this option is not selected, the show completed filter will not appear on the explorer.  Assigned To. If this option is selected, this filter will appear on the line item explorer. If this option is not selected, the assigned to filter will not appear on the explorer.  Order, Estimate, or Recurring Order Number. If this option is selected, this filter will appear on the activity explorer. 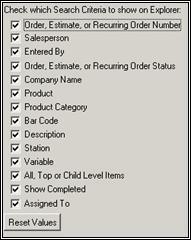 If this option is not selected, the order, estimate, or recurring order number filter will not appear on the explorer.  Company Name. If this option is selected, this filter will appear on the activity explorer. If this option is not selected, the company name filter will not appear on the explorer.  Contact Last Name. If this option is selected, this filter will appear on the activity explorer. If this option is not selected, the contact last name filter will not appear on the explorer.  Employee. If this option is selected, this filter will appear on the activity explorer. If this option is not selected, the employee filter will not appear on the explorer.  Show Detailed Entries. If this option is selected, this filter will appear on the activity explorer. If this option is not selected, the show detailed entries filter will not appear on the explorer.  Show Completed. If this option is selected, this filter will appear on the activity explorer. If this option is not selected, the show completed filter will not appear on the explorer.  Activity Class. If this option is selected, this filter will appear on the activity explorer. If this option is not selected, the activity class filter will not appear on the explorer.  Ticket Number. If this option is selected, this filter will appear on the service ticket explorer. If this option is not selected, the ticket number filter will not appear on the explorer.  Salesperson. If this option is selected, this filter will appear on the service ticket explorer. If this option is not selected, the salesperson filter will not appear on the explorer.  Entered by. If this option is selected, this filter will appear on the service ticket explorer. If this option is not selected, the entered by filter will not appear on the explorer.  Status. If this option is selected, this filter will appear on the service ticket explorer. If this option is not selected, the status filter will not appear on the explorer.  Company Name. If this option is selected, this filter will appear on the service ticket explorer. If this option is not selected, the company name filter will not appear on the explorer.  Product. If this option is selected, this filter will appear on the service ticket explorer. If this option is not selected, the product filter will not appear on the explorer.  Product Category. If this option is selected, this filter will appear on the service ticket explorer. If this option is not selected, the product category filter will not appear on the explorer.  Bar Code. If this option is selected, this filter will appear on the service ticket explorer. If this option is not selected, the bar code filter will not appear on the explorer.  Description. If this option is selected, this filter will appear on the service ticket explorer. If this option is not selected, the description filter will not appear on the explorer.  Station. If this option is selected, this filter will appear on the service ticket explorer. If this option is not selected, the station filter will not appear on the explorer.  Show Completed. If this option is selected, this filter will appear on the service ticket explorer. If this option is not selected, the show completed filter will not appear on the explorer.  Assigned To. If this option is selected, this filter will appear on the service ticket explorer. If this option is not selected, the assigned to filter will not appear on the explorer.  Parameter. If this option is selected, this filter will appear on the service ticket explorer. If this option is not selected, the parameter filter will not appear on the explorer.  All, Top or Child Level Items. If this option is selected, this filter will appear on the service ticket explorer. If this option is not selected, the all, top, or child level items filter will not appear on the explorer. Reset Values Button: If this button is clicked, it will reset all your current selections to your default selection.